What Happens if a Neighbor’s Tree Falls in My Yard (or vice versa)? 10 Nov What Happens if a Neighbor’s Tree Falls in My Yard (or vice versa)? Under most circumstances, homeowners are responsible for trees that fall in their yard. That means that your homeowners insurance should cover the removal of the tree if it causes any damage to your property. Conversely, your neighbor’s homeowners insurance would cover removal if it was your tree that fell on their yard and caused damaged. What Should I Do if a Tree Falls in My Yard? The first thing you should do if a neighbor’s tree falls in your yard is take photos for documentation purposes. If safety isn’t a concern, you’ll want to contact your insurance provider before calling a tree removal company. That way the appraiser can fully assess the damage and begin the claims process. Regular tree maintenance in Jacksonville is the best way to keep trees from falling and causing major damage. It’s the homeowner’s responsibility to take care of the trees on their property. 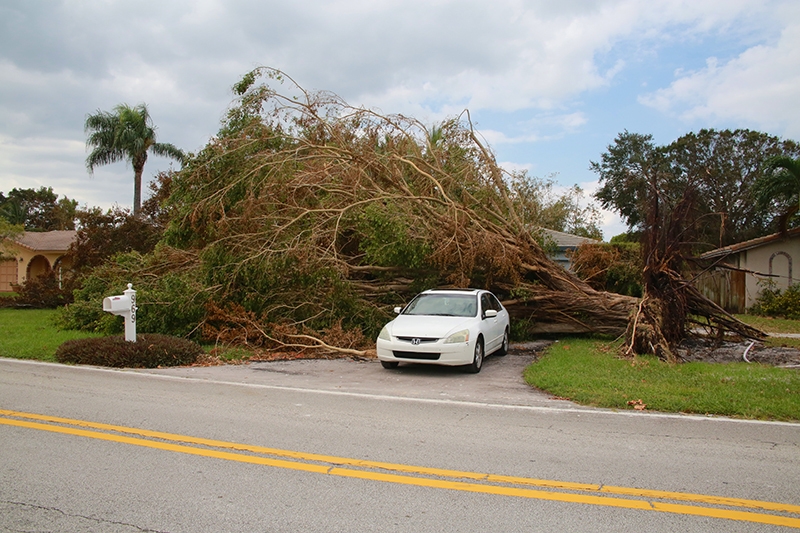 Trees that aren’t properly pruned and maintained are not as strong and are more susceptible to damage from high winds. It’s important to have decaying or damaged limbs removed by a certified tree service to avoid problems. If you don’t maintain your trees, you could be liable if one damages a neighbor’s property. You also may be liable for damages caused when a known dead or dying tree falls on its own. Recent storms and hurricanes have done a number on even the largest trees in our area. This type of weather is considered an Act of God by insurance providers. This means that tree owners are not responsible for damage to neighboring properties. Contacting a certified arborist to inspect your trees periodically can help you avoid having it fall in your neighbor’s yard. They will be able to tell you if it needs any special treatment, pruning or removal to avoid damage. If your neighbor’s tree falls in your yard, TREECO can help. Our certified arborists and tree surgeons are highly skilled and safety-certified. We have the proper equipment for even the biggest tree removal jobs. Contact us at (904)810-1033.